Though Facebook growth may be slowing here in the US, the social networking service has been doing very well overseas; especially in Brazil. In fact, at the end of 2011, the service pulled into the top position for Brazilian social networking sites and surpassed the long-favored Google Orkut service. According to comScore, Facebook managed to attract 36.1 million monthly unique visitors by the month of December in 2011. The rapid growth in Brazil since December 2010 marks an increase of 192 percent. 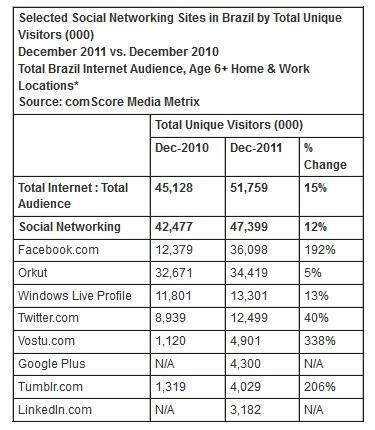 Despite Facebook’s new lead, Orkut managed to grow by 5 %, and ended 2011 with 34.4 million visitors. The total Brazilian Internet audience includes those ages 6 and older who access websites from either a home or a work computer. “Brazil has always been a particularly social market and currently owns the fifth largest social networking population in the world. But despite the cultural affinity for social media, Facebook adoption had traditionally lagged in the market. That has all changed in the past year, during which the site has tripled in audience size,” said comScore managing director for Brazil, Alex Banks. ComScore points out that, not only have the number of users grown for Facebook, but so has interest. Average visitors spent 4.8 hours on the site, up from 37 minutes in 2010. The average number of monthly visits rose by 163 percent, and users average page views increased by 655%. Though the majority of Facebook interest began in Brazil’s Southeast region, traffic is now widespread across the country. Visitors from Rio de Janeiro and Distrito Federal seem to be the most interested in Facebook, spending an average of 5.1 hours on the social networking site. Brazilian women also tend to average more time on the site with an average of 5.3 hours versus the males 4.1 hours. Along with Facebook’s growth Twitter visitors have grown by 40%, which puts the micro-blogging site in the number 4 position for popular social networking sites. Interest in Vostu and Tumblr have grown dramatically, with an increase of 338% and 206% respectively. The Facebook numbers seem to have dropped off for early adopting countries like the US and the UK, with these types of numbers in countries like Brazil, Facebook is well on its way to the iCrossing projected 1 billion users by late-summer.